Whilst I was cruising around Amazon the other day I noticed two cool things: 1. my book has returned to the price of free, and 2. there's a book called Basic Fantasy selling at cost in the Books section of Amazon.com. I checked out the 'look inside' preview and read some of the reviews. 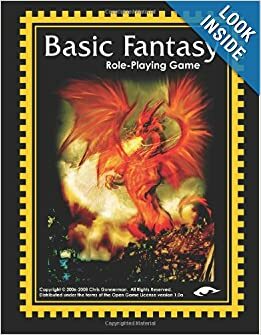 Soon I found out that it was a remake of the original D&D designed by a load of people who were giving it away for free along with many adventures and other fine resources on their website at http://www.basicfantasy.org/downloads.html. I already own the original D&D books, but if you haven't ever read them before and you're on a budget, this might be the remake to check out. There are a few minor changes from the original, but they're mostly pretty cool, and a savvy GM should be able to fix anything which is seriously messing up the game. Also, even if you're not interested in the game itself, it would be great for ideas.